It’s the Fall season and everyone is gradually winding down from the high’s of the summer vacation for those who were able to go for it, I wasn’t. But then Fall season kind of heralds the coming of the cold season and we have to prepare for that season. The exciting thing about the Fall season is that we will soon have winter and the Christmas holidays on hand. As a business person who wants to start a business from home, you may be wondering what business ideas will suit the season we are in right now. You might even be that person that loves to take advantage of a seasonal business in other to make some extra income for your home. You don’t have to worry again, yours truly went to town and researched business Ideas that start within this Fall season. 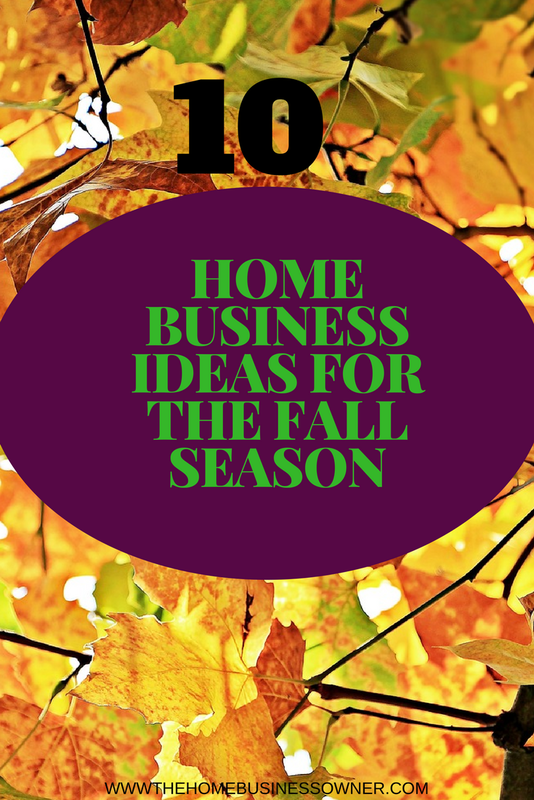 That’s where I came up with this 10 Home Business ideas for the Fall Season. -You get a lot of sales coming in because it’s the season for that product or service, for example, once the weather gets cold, there will be a rise in demand for winter accessories or clothing. You are carried along in that tide hence your little marketing efforts will produce much yield because there is a demand. -You cash into peoples emotion to make a quick sale, the Christmas season is when people are willing to buy gifts and send to family so you can easily get a gift packaging and wrapping service ongoing that will bring in a tidy amount. -Though it’s within a short period you can plan to make the most of it by researching for a moving product or service and making a good amount of profit. For instance, if you start preparing for the Fall season early enough you can buy goods at slashed prices and sell for a tidy profit when it’s in demand. -Its the season for that Product or service and people cannot do without it. One of the reasons I love Fall is because it comes with its own Fashion accessories and Clothing that connotes its own style and are really beautiful to look at. Because the season presets winter, the leaves are falling and the temperature is dropping so there is a rise in demand for fashion accessories and clothing like : Scarves, (knitted woolen scarves) Shawls, mufflers, Ponchos, Hand Gloves, socks, Tweed Jackets, winter jackets, Hoodies, Leggings, and Tote handbags for carrying all that extra stuff especially if you are a mom. All these are accessories and clothing that will make the Millennial person rock the season. You can tap into this huge market by either Drop-shipping such items or selling your own handmade products on Etsy or you can also sell on online sites like Bonanza and eBay. You can read up the underlined posts in this paragraph to get a more in-depth knowledge on. Did I mention that it’s important to do your research properly to know what range of fashion accessories and Clothing are currently trending, dive into that trend and you will be making your profit. As we enter the Fall season, we usually call it the “ember” months in my local parlance, it seems like the days begin to gallop in anticipation of the various holidays that will be coming up, Thanksgiving, Christmas, Boxing day, Hanukkah etc. All these festivities portend the exchange of gifts and delivery too, hence a seasonal business that does Gift shopping, wrapping and delivery will be a good combo that people will be willing to subscribe to. Think of how busy people can be that they soon forget to get their loved ones gifts until the holidays arrive. This is often the reason for the mad rush at shopping malls during festive seasons, in fact for me I think that that mad rush often adds to stress for anyone going through it. Instead of enjoying the holiday you are busy scurrying around for the best gift for a friend or a family member. Starting a business that takes that stress off families can make a whole lot of difference. In this aspect, I will like to include both types of equipment for removing snow and winter based sports equipment. I deliberately added sales and rental together because not everyone will like to buy an equipment for a season. You have the opportunity where you can either sell or rent such equipment then you can have two streams of seasonal income. Example of such equipment for winter sports includes snowboards, skiing equipment, and accessories, Skating boards etc.Secondly, you have the snow removal equipment like Snowplow, Salt spreaders, Liquidisers and Pushback blades. These are heavy machinery though so you have to understand the business before you go into it. This is a must need for homes during the winter period so as this period arrives, there is a high demand for services like this. Last year, I think it was in December my Kids couldn’t go to school for a whole week because a Pipe had burst, that one tragedy cost their school a whole lot of money and lost revenue. They were shut down for a whole week and they had to rebuild about 3 classes because the burst pipe had damaged the floors and caused a lot of havoc, plus they had to have an inspector in-house to make sure they were ready to resume activities. I bet that if they had taken time to winterize the facility, they would have reduced the chances of what happened. Services like this can mean a lot of saved finances down the line so you can understand why such a service will bring in the needed cash during this season. Winterizing services can include, closing drafts on windows, doors and anywhere that has a loophole to reduce the loss of warmth hence reducing your energy bills. Weatherproofing your pipes to prevent bursting due to icing. Having general instructions placed in strategic places to remind house owners on how to ensure that their homes remain weatherproof for the season. Offering on-demand repair services where there is a need for it during the season. Who doesn’t love the decors that you see on homes during the festive season, Christmas lights anyone? those are what makes Christmas what it is , but then it’s someone’s business to put it up right? That’s where you can start a seasonal home business that will help people decorate their homes for the season, be it Christmas, Hanukkah or Thanksgiving. Starting on time to make your services available and getting people to pay monthly before the day arrives ensures that you have the number of homes you can handle on the ground before the 1st of December arrives. Early booking means you are sure of your income and you can do what is necessary to deliver when the time comes. I love those lighted Reindeers on the lawns, they make Christmas so endearing. If you are someone who loves to bake, this may be the time to monetize your baking skills by offering packaged holiday cookies and all types of treats to friends and family and also others who may be interested. Once they have tasted it and it’s worth the amount you are offering, they will surely be willing to pay for you to bake and deliver to their homes during the Christmas holidays. During the Fall season, we get to start the preparation for all kinds of Parties that will take place during the holiday season from office parties to Thanksgiving dinners to children’s Christmas parties, wedding anniversary parties and you just name it. If you have a knack to organize and throw a great party, now is the time to begin to put together a plan on how to turn your talent into a business that you can cash into in this season. Getting your client at this time will ensure that you have a long time enough to prepare for the events that will hold. If this is a home business that suits you, it can become an all-season thing though you will find that most of your sales come during the Winter and Fall season. The season of Christmas is a season that everyone wants to have a tree with all those lights on it and the gifts wrapped under it. Starting a Christmas tree rental service can be a great way to cash into the season to make some income. You can throw in decorating the tree as an extra service if people want to pay for it. I know most families love to decorate their Christmas tree themselves I mean where is the fun of having a tree if someone else decorates it for you?But then there are those who might just like a tree put up for them because they can’t decorate it themselves. For example, the elderly who may not be able to hang that lighting anymore. There are also people who don’t like to decorate a tree at all. Offering that service of decorating the tree could be an add-on which they will appreciate. During the Christmas of 2015, I did my Home Christmas decoration and tree decoration with the help of my sister, it was still a lot of work. After all the décor, my daughter who was about one year plus kept plucking the shiny balls that I hung on it, she taught it was a fruit. Before the Christmas day arrived. We only had decoration at the very top where her hands could not reach. Talk of having Christmas Tree with sparse hangings, it was very funny. Do you have a free room or spare room in your home that you are not using? now is the time to set it up for and rent it out for Holidaymakers who may not want to go to the average hotel. You can rent it via Airbnb to make some money. The beautiful thing about holiday home rental service is that you have the opportunity to meet diverse people and make new friends while still making money out of it. Anyone that can relate to Holiday shopping knows the hassles and stress it can bring to anyone who has been through. Remember the long lines and queues in Walmart and Co, you can save some busy people the hassle and stress by taking on their holiday shopping for them. All that Turkey buying, food shopping and also clothing shopping can be done by you while the person relaxes at home and watches TV or whatever they need to do during the holidays. I have always been one to simplify my life hence why I like Blue Apron and the services they offer. You get your ingredients and recipes all done for you so all you have to do is follow instructions and cook. Don’t know if there are other Blue Apron type moms like me but I value the time I spend on my business or family, I don’t like to waste it running needless errands or getting stuck in shop queues. Holiday shopper? Sign me up! Lol, Angel looks like you love that. It’s a cool way to make money during the season. These are pretty clever ideas to earn some extra cash from home. You never know, some of these can actually turn into a full business. Such great side-hustle ideas! These are great ways to start, especially since they are short-term, and thus not as daunting. Great list! Christmas Tree Rentals? Now, that’s an idea! wow, I’ve never thought of this before. The holiday period has a lot of opportunities to make more cash. Thanks. Yeah it sure does. The good thing about holidays is that people are willing to spend. These ideas absolutely sound so much fun … I’m excited fr the happy holiday season!!! These ideas are amazing! A lot of them I hadn’t even thought of before, but they make perfect sense.